After thousands of generations, you can imagine how the energy has been mixed together. This is one reason why strangers seem familiar to us (the other is the 500 original "types" of people) and why "love at first sight" happens. 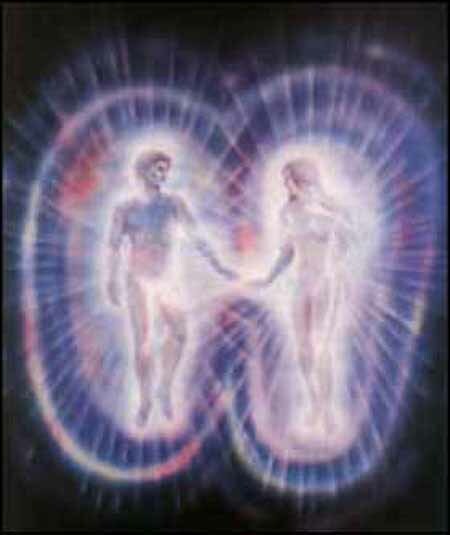 Part of the soul (aura) of the other person is familiar to you–it could be a part of YOUR soul mixed in, or part of the soul of one you once loved. I don’t believe in the concept of "soulmate" as most do: the concept of a "split apart" or that once you were one person, one soul, now each of you is half, searching the globe through every lifetime looking for your other half to fulfill you and make you whole. It sounds good, in a romance-novel happily-ever-after kind of way. But it also means that if your soulmate doesn’t incarnate with you, or if you miss the cues to meet, you’re destined to live a cold and lonely life . Or I guess you could find someone else whose soulmate wasn’t available and hook up with them, spending your life with the wrong person, making four people miserable living without their soulmates. Any way you look at it, that concept is pretty depressing. I don’t want to be half a person. I AM whole. The others in my life enrich me, they don’t complete me. I was excited to hear this, because I know how the souls subdivided. I’ve know for years, only it was part of my soulmate theory, not about the original souls seeded on Earth. Let’s imagine a small group of original souls. Each soul (person) is a different color. (I don’t mean skin, I mean energetically. Think "aura.") Fred, who is red, falls in love with Wilma, who is yellow. Part of the love process, the love vibration, entails exchanging a piece of soul. So Fred now has a spot of Wilma’s yellow in his red aura and Wilma has a red spot of Fred’s in her yellow aura. The love between Fred and Wilma is true unconditional love, and marks them for all eternity. Meanwhile, Fred’s best friend is Barney, who is green. They also share unconditional love. Now Fred has a red aura with a spot of yellow and a spot of green. They all die and go Home. In their next incarnation, Wilma meets Barney and falls in love with HIM. Wilma recognizes the bit of red from Fred’s soul in Barney. There could even be a tiny spot of yellow from Wilma’s soul in Barney (transferred through Fred, as part of Fred’s love for both). The vibration of Wilma’s soul reacts to the "familiar" vibration of Barney (even if she never met Barney in her last life). I have expanded this theory to pets and animals. I don’t believe that most "wild" animals have souls–they have spiritual energy which is reabsorbed into the Source when they die. (A deer dies and its deer-ness gets reabsorbed into the Great Deer, and a bit of that Great Deer breaks off and makes a new deer, over and over--that's how species memories work and how animals are born knowing how to do things already.) When we love an animal that we've made into our pet, we give it part of OUR soul. That soul can then re-incarnate and move up the evolutionary ladder if so desired. (I know a dog who has only ever been a dog and has no desire to ever be any other animal. He recently died and I spoke with his spirit for his owner, and he assured me he’d be back as soon as he could, as a big fluffy dog again–he wanted to be black this time.) If your beloved ex-hamster decides to return as a squirrel, then he keeps his soul, obviously, and no doubt he’ll be one of those squirrels who isn’t afraid of people and begs for food in the park. Can a bit of soul that was once yours, given to a hamster when you were five years old, ever become a person? I believe it can. The hamster is just as much a part of the Source as you. As it is loved by other people and collects more souls ("collect the whole set"–you know, like playing Monopoly at McDonalds), it can move up the ladder toward personhood. I also believe that a person can take a lifetime or two "off" from being a person and be an animal. I have strong past-life memories of being a rat, a horse & a dinosaur. I also believe that, 100 generations from now, if that hamster became a person, you might fall in love. You would certainly meet in the other side of the veil, and be pleasantly surprised at what you created out of unconditional love: a whole new soul to play the Game. That’s how 500 original souls grew to become over 6 billion people–through unconditional love. The love you’ve given to a hamster, a frog, a cat, a dog, a ferret, a horse, a goldfish–whatever "lower creature" you have truly loved unconditionally–has changed and enriched the world. Love is never wasted. You always get more than you give back, and now you know how it works. Note: please don’t think this invalidates the idea of aura readings and that colors in the aura correspond to feelings and illnesses. I used the aura as an example; the actual energy is more subtle than the aura.